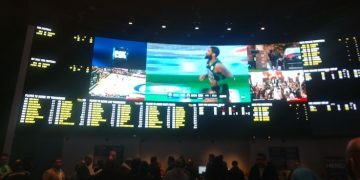 A federal sports betting bill that surfaced on Tuesday helps shed light on a deal the National Basketball Association announced one week earlier — that it’s joining forces with both Genius Sports and Sportradar to form non-exclusive sports wagering data partnerships designed to supply data to sportsbooks in legal, regulated U.S. markets. The agreement with both companies, among worldwide industry leaders in providing betting data, includes all NBA teams and games and is effective immediately. The arrangement also includes the WNBA, when that league resumes action in the spring. (II) an entity expressly authorized by the applicable sports organization to 24 provide such information. Hatch is out of office soon and we have no idea what the 116th United States Congress may bring in 2019. 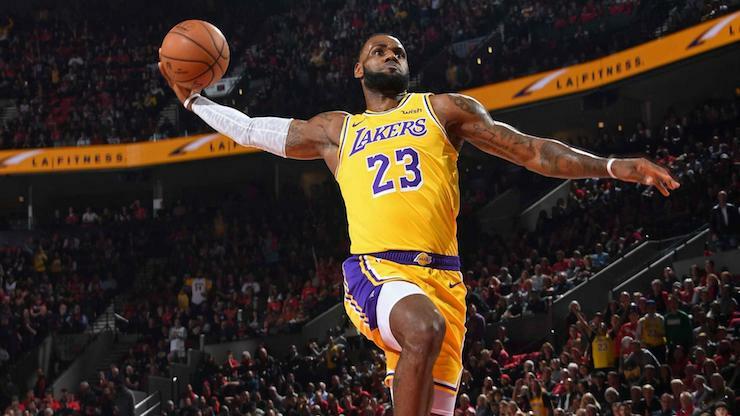 But whether on a federal or state level — the former much preferred for the NBA — the league is laying the groundwork to have Genius Sports and Sportradar installed as the suppliers of real-time betting data and NBA products to legal sportsbooks across the country. The NBA’s strategy of monetizing its data for U.S. sports betting has been apparent all along and began with Sportradar overseas in a deal worth $250 million over three years. The creation of multiple non-exclusive deals is key here in the U.S., for the NBA to guarantee competitive pricing and avoid accusations that it is seeking to create a data monopoly. Said Sportradar U.S. president Matteo Monteverdi: “This agreement is an organic extension of the relationship that we have in place already for several years.” Sportradar, outside of the U.S., is in the midst of what sources tell Sports Handle, is an ongoing three-year deal that includes this season, as the official provider of NBA data, including real-time information typically utilized in “in-play” betting formats, in addition to acting as the official distributor of all other NBA betting data. The Sportradar-NBA arrangement outside the U.S. grants exclusivity to Sportradar. An industry stakeholder with knowledge of these types of business alliances, speaking anonymously because of their sensitive and highly competitive nature, told Sports Handle, that data companies, such as Sportradar and Genius generally pay a league, in this instance the NBA, a set fee for distribution rights. Bookmakers, who subsequently buy the data feed from Sportradar and Genius, then charge bookmaking operations a percentage payment of some sort, often based on the total amount of wagers handled by the bookmaker. 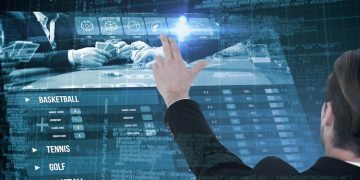 The percentage of handle arrangement as opposed to a flat dollar amount allows the data provider to participate in the growth of “in-play” betting without actually functioning as a bookmaker itself. This sort of deal also insulates the data provider and the league, as well, from all the regulatory and licensing hurdles a bookmaker is subjected to, it was explained. “If the percentages are reasonable, it’s a win all the way around,” the source emphasized to Sports Handle. When NBA commissioner Adam Silver publicly addressed in February the league’s pursuit of an “integrity fee,” now termed a “royalty” among other things, he created a firestorm among bookmakers who feared they could be shut out of “in-play” markets, if they refused to pay whatever fee the NBA demanded for such information. The non-exclusive nature of the Sportradar/Genius/NBA alliance allows the NBA to remain open to additional deals with “credible parties who are willing to pay the NBA an appropriate amount for distribution rights,” Sport Handle was told. The NBA has led recent efforts from the major U.S. sports leagues to persuade sportsbooks to utilize its official league data, regarded as a necessity for bookmakers offering extensive “in-play” wagering. Wagers on various outcomes and propositions while sporting events are already underway, called “in-play” or “in-game” wagering, have long been an important attraction for bettors and bookmakers outside the U.S. 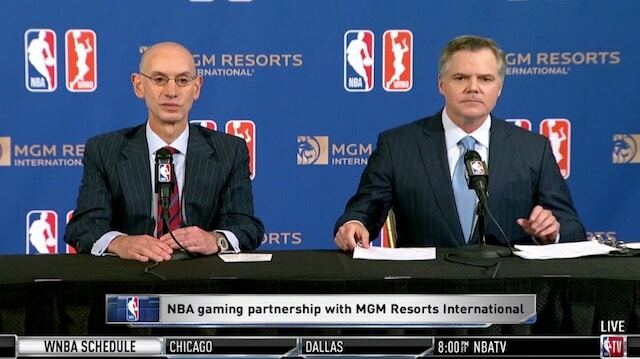 Most industry insiders now say it’s the fastest growing segment of the emerging sports betting marketplaces in the U.S.
On July 31, the NBA joined MGM Resorts International in an official gaming partnership, announcing it would provide official data to MGM. One day earlier, MGM had aligned itself with GVC Holdings PLC, which owns the Ladbrokes Coral Group PLC forming MGM GVC Interactive, a shared venture between the British-controlled bookmaker, and MGM. Branding considerations that include usage of league and team logos and data access were announced as key components of the MGM GVC Interactive/NBA arrangement. MGM in recent months has announced official, non-exclusive sports betting partnerships emphasizing branding and data access with the NHL and just last week, with Major League Baseball. Other recent alliance announcements include the NHL’s Vegas Golden Knights and William Hill US and the New Jersey Devils partnerships with both both William Hill US and Caesars Entertainment, and the soon-to-be NFL Las Vegas Raiders and Caesars Entertainment. All focus on promotional and fan engagement opportunities rather than league data. 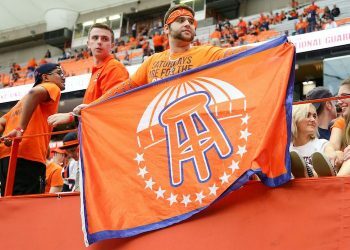 Additional deals are expected to sprout up and bloom as more and more states take advantage of the tax opportunities new sports betting marketplaces provide. Sports Handle contributor Robert Mann has a Northwestern journalism degree and is a former reporter for the Chicago Tribune and National Enquirer. He has worked in news management for CNN and several TV stations and is a 31-year resident of Las Vegas.